North Carolina’s Lake Julian, which covers 300 acres in Arden, N.C., near Asheville, is a kayak bass fisherman’s dream. Two things will keep a sportsman awake at night during April: the thought of turkeys gobbling on the roost and big largemouth bass hanging on the bed. Some figure out how to scratch both itches. But if big, watermelon-colored fish staring back at you from the shallows gets your blood pumping, staring back at the fish from atop a kayak will set it to a boil. Bass fishing is the fastest-growing segment of the fastest-growing component of the fishing community: kayak fishing. 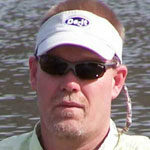 Kayak bass tournaments provide great competition weekend events or as ongoing, online events. 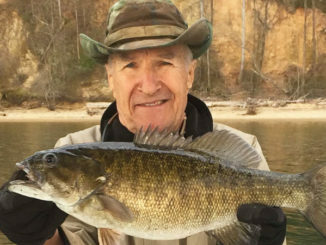 Ask any bass fisherman, and most will say late March into April is their favorite time to chase largemouth and spotted bass that frequent both Carolinas. Depending on which area of the two states you fish, bass may be finishing up the spawn and heading into postspawn in the southern and eastern regions of South Carolina. Or they may still be in prespawn in the northern and western regions of North Carolina. One thing is for certain: ample rainfall over the past few years will have many backwater areas in major impoundments full of new-growth foliage and rising water. Such locations make for great spawning areas and less-pressured areas for paddling bass anglers. Another spring event that makes bass fishing great is the timing of the spawn for bass prey species. This is especially true for bluegill and threadfin shad. The presence of prey will move trophy largemouth into shallow waters during the prespawn. And it will keep them there during the postspawn, while assisting with recovery. The wide variety of soft-plastic baits on the market mimic everything from baitfish to frogs to crawfish. That tends to make the old-fashioned plastic worm a thing of the past. For shallow-water fishing for spawners, these baits can be rigged weedless to cast into heavy cover without snagging. 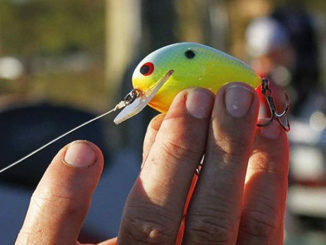 They can also be attached via Carolina rig, Texas rig or directly to the end of a jig for more-precise placement. This is particularly useful when sight-fishing for bedding bass when fish tend to stay put unless a bait or lure is dropped right inside the nest. Kayak anglers are not limited to only fishing where paved public ramps provide access to water. This opens up a myriad of farm ponds, water-retention areas, creeks, rivers and sloughs as well as many small-body, motor-restricted lakes and the backwaters of big lakes. April is a shallow-water bass fisherman’s dream. There is no better time to be on the water with a paddle in one hand and a fishing rod in the other. Saturday Mel is a member of the Hobie Kayaks regional team from Hendersonville, N.C. He competes in kayak bass tournaments, including many of the big impoundments in North Carolina, South Carolina and beyond. During the spring, competition between powerboat anglers and kayak anglers puts a lot of pressure on spawning bass. Those are the days when Mel exercises his “go-anywhere” paddling option and fishes smaller impoundments where power boats are limited or not allowed at all. Near the top of his list is Lake Julian, near Asheville, N.C.
Lake Julian is a lake covering approximately 300 acres in Arden not far from Asheville’s famous Biltmore House. Mel said another not-so-secret aspect of Julian is that it is stocked with tilapia. The bass tend to follow the schools of tilapia and feed heavily on them. Julian also serves as cooling agent for Process Energy’s Asheville plant, which makes the lake thermal. “You can watch the stacks, and when both of them are releasing steam, you know they’re running water and that’s when the fishing is the best. Lake Julian has one public access area at Lake Julian Park, including a boat launch. Daily or annual fees are charged to use the boat launch. A local lake permit is required. Lake Julian Park is located at 406 Overlook Rd, Ext, in Arden. 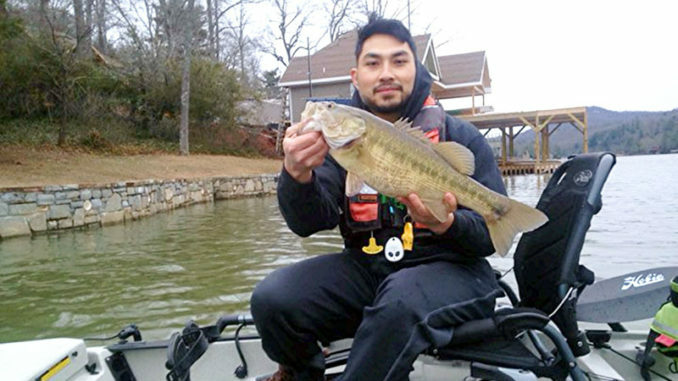 WHERE — Lake Adger near Saluda, N.C.
HOW —Adger has a later spawn than most North Carolina lakes. Throw Senkos, jigs and soft plastics to find spawners and prespawn fish around numerous laydowns and rocky points. LAUNCH — Public access is by easement across private property. No charge for use. Ramp is located on the upper end of the lake off Lake Adger Rd in Mill Spring. INSIDER TIP — Muskellunge are stocked in Lake Adger. Not every bite on large soft plastics will be from a bass. WHAT — Largemouth bass, spotted bass. 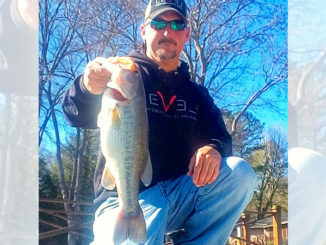 WHERE — Lake Murray near Columbia, S.C.
HOW — Throw soft plastics, jig ‘n’ pig around boat docks. INSIDER TIP —Lake Murray has a good shad spawn that occurs at the tail end of the bass spawn. Look for shad to congregate around boat docks with suitable cover. This rod was brought out by St. Croix to provide an ideal rod for anglers interested in kayak fishing, combining the framework of the Mojo series with updated components. Constructed from high-modulus SC III graphite blanks, Mojo Yak Casting Rods have been specifically crafted using Integrated Poly Curve mandrel technology to provide precise, technique specific actions that meet the demands of kayak enthusiasts. Two models are available: 7-foot, medium-fast and 7-foot-6, medium-heavy. Both have 3D guides, Fuji reel seats, split-grip handles and Kigan hook keepers. They come with a 5-year warranty. Suggested retail price is $150 for the 7-foot rod and $160 for the 7-foot-6 rod. More info at stcroixrods.com. To craft the fully updated Ascent 12T sit-on-top kayak, designers took Ascend’s most-popular sit-on-top model and made it even more stable, functional, and comfortable. The advanced tunnel design, with a wide transom and flared bow, makes for a kayak so stable you can stand and cast. The design also produces outstanding tracking and easier paddling. When standing, you’ll stay comfortable thanks to the non-skid foam deck mat. Port and starboard accessory-mounting rails and a recessed bow storage area with flush-mounted bungees also allow endless accessorizing for true customization. Flush-mounted paddle holders ensure easy-reach paddling, and the deep-molded drink holder/storage and watertight storage areas deliver reliable containment for your vital gear. The Ascend 12T works perfectly with the optional RedHead® waterfowl blind, making it a perfect option for duck hunting in addition to all your angling demands. This 12-foot kayak weighs 77 pounds. Maximum weight capacity is 350 pounds. Suggested retail price is $599. Available at basspro.com.